The TOP-10 Alleged Fakes In Heritage’s Platinum Night Auction In NYC; JSA’s Jimmy Spence & PSA’s Steve Grad Authenticate Lots Of Fool’s-Gold (UPDATE) Alleged Fakes Sell; #11 Added & PSA Agrees? Heritage's Platinum Night Auction features lots of "Fool's Gold." Heritage Auction Galleries planned for it to be an extravaganza featuring stunning sports artifacts selling for record prices, but what its Platinum Night Auction in NYC has devolved into is a sad commentary on the apparent ineptitude of the Third-Party authenticators (TPAs) JSA and PSA and their head honchos James Spence Jr. and Steve Grad. Two of the entries have already been withdrawn from the sale as chronicled by The New York Post and others may follow depending on the outcry from collectors and perhaps a visit to the Platinum event by the New York office of the Federal Bureau of Investigation. We haven’t seen this many problems on alleged top-flight items sold in New York City since the infamous Halper Sale at Sotheby’s in 1999. Some of these Heritage lots could have competed on the Upper-East Side with Halper’s “Fake 500 HR Signed Sheet”; “Lou Gehrig’s Last Glove”; and the record-breaking and dubious single signed Babe Ruth portrait ball. Haulsofshame.com took to the streets and tracked down several of the experts in the field who we rely upon and asked for their “considered opinions” on the current Heritage Platinum Night offerings. We’ve withheld the identities of the experts for fear of getting them banned from future Heritage extravaganzas and auction sales. 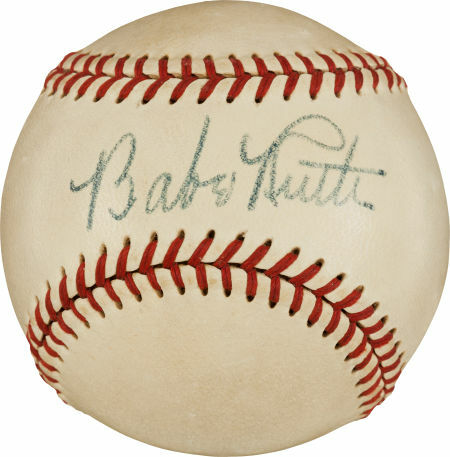 There are still lots of other impressive authentic items in the Heritage sale including Olympic memorabilia from Mike Eruzione, a collection of material being sold by Walter Johnson’s family, an authentic 1927-28 Lou Gehrig Yankee road jersey, an authentic Christy Mathewson letter, an authentic signed Babe Ruth Bat, a nice Gehrig signed portrait, Curt Schilling’s “Bloody Sock” from 2004, a green jacket from The Masters and, oh yeah, the earliest Red Sox letter with a signature of Babe Ruth that is believed to have been stolen from the Baseball Hall of Fame’s Herrmann Papers Archive. We’re sure that one is real, as is Heritage’s Mike Gutierrez, who authenticated many other Herrmann letters of Mathewson, Huggins, Jennings, Clarke, McGraw and others for the Sotheby’s Barry Halper Collection sale in 1999. Heritage was sued this week in a Dallas, Texas, court by the Augusta National Golf Club, who claim the “Green Jacket” being offered was stolen property. It appears the Masters has more respect for a piece of clothing than the Baseball Hall of Fame has for historic documents from the Herrmann Papers Collection, as Cooperstown has made no such effort to recover its property. As for the ten lots chosen in this report, they represent an estimated low-end auction value determined by Heritage to be close to $500,000. 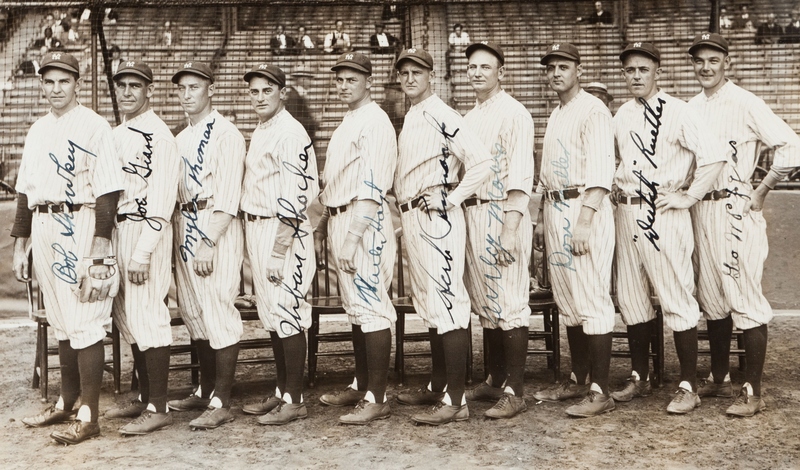 Heritage is 100% confident in the authenticity of the 1927 Yankees team signed baseball or it would not be included in the auction. We are one of the very few auctioneers that employs not one, but both of the two most respected and trusted firms in the industry—PSA/DNA and James Spence Authentication. Both of these services have authenticated the autographs on this ball without reservation. The baseball derives from the personal collection of Earle Combs, the Hall of Fame center fielder for the 1927 New York Yankees and includes a letter from the close personal friend to whom the ball was given by Combs. As such, Heritage is completely comfortable with the authenticity of the baseball. It was only in the past ten years or so that an exhaustive study of the minor variations in stamping styles on Official American and National League baseballs determined that the A.L. balls used in 1927 were a one-year style. In other words, American League baseballs made in 1926 and before, and 1928 and after, are physically different in their stamping styles from the 1927 model. The Combs team ball is the correct 1927 one-year style. 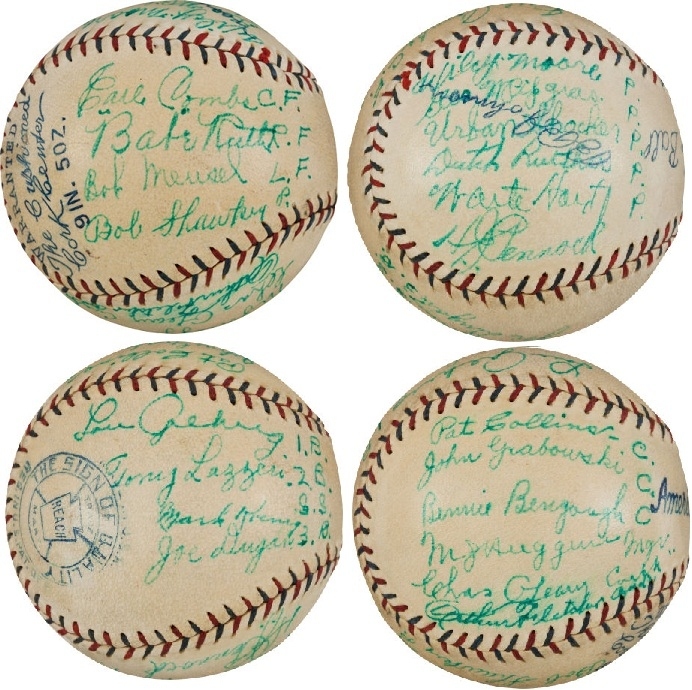 So the suggestion that a supposed forger would have known this fact prior to the ball’s first public appearance in 1999, then could have tracked down a pristine example of that exceedingly rare style to use for his forgery, and lastly had the skill to perfectly execute these autographs to pass the finest authenticators in the industry is truly preposterous. If the winning bidder would like to have the baseball sent to the FBI labs at Quantico, VA, then we would be pleased to work with them to help facilitate that process prior to the settlement of the auction and as long as the process did not damage the baseball in any manner. 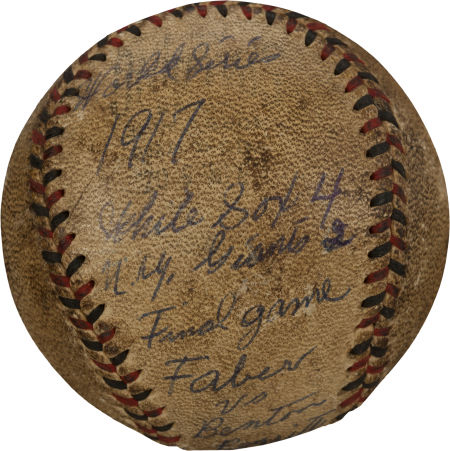 No reasonable person would believe that Heritage would risk a significant financial loss by marketing a piece in which we did not have complete faith, and we emphatically stand behind the authenticity of this baseball, as do the top experts in the autograph authentication profession. 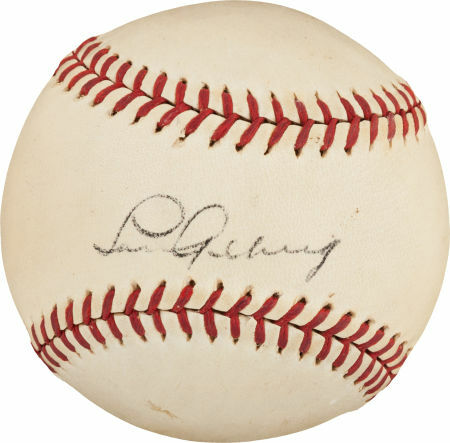 The two signatures on baseballs (to left) were signed in the same hand, but not Gehrig's. The two signatures on baseballs (to right) were signed by Gehrig. A comparison of the two signatures on the current Heritage Auction ball and the 2008 Mastro ball (left, top and bottom) with the two signatures from the Lelands 1939 Yankee team ball and the 2013 REA Ruth and Gehrig ball (right, top and bottom) shows a striking disparity in similarities. The Heritage and Mastro examples appear to be signed by the same hand (but not Gehrig’s) and the Lelands and REA examples are both signed by the same hand–Lou Gehrig’s. Apparently Steve Grad (PSA) and Jimmy Spence (JSA) are still sticking with their original determination that the Heritage offering is authentic. Every expert we consulted with disagrees and points to the visual evidence above. The illustrations don’t lie. The great irony (or tragedy) here is that while Grad and Spence stand behind authentications on the Heritage and Mastro Gehrig balls, they also authenticated the genuine ball which will appear in REA’s Spring sale. Lelands didn’t need the combined expertise of Grad and Spence for their ball, they could figure out it was authentic all on their own. As Ivy and Heritage extol the virtues of the alleged source of the 1927 Yankee team ball, they should look to this Faber ball for a reality check. The 1927 Yankee ball originates from an alleged neighbor of Earl Combs and when asked several times to produce the said neighbor’s letter, Ivy has failed to produce it. The bogus 1917 World Series’ “Final Out Ball” came with an affidavit from an actual family member let alone an alleged neighbor. If there is, Heritage won’t furnish it or make it public. Why? The experts reaction to this this melting pot of the Steroid-Era Sluggers and the “clean” Yankee legends was strong and the consensus was that the Ruth signature was definitely a forgery. Attempts to reach Barry Bonds and Mark McGwire to ask if they actually signed the ball were unsuccessful, but an expert familiar with the signatures of both was highly critical of the signatures comparing them to many in-person examples he had obtained. 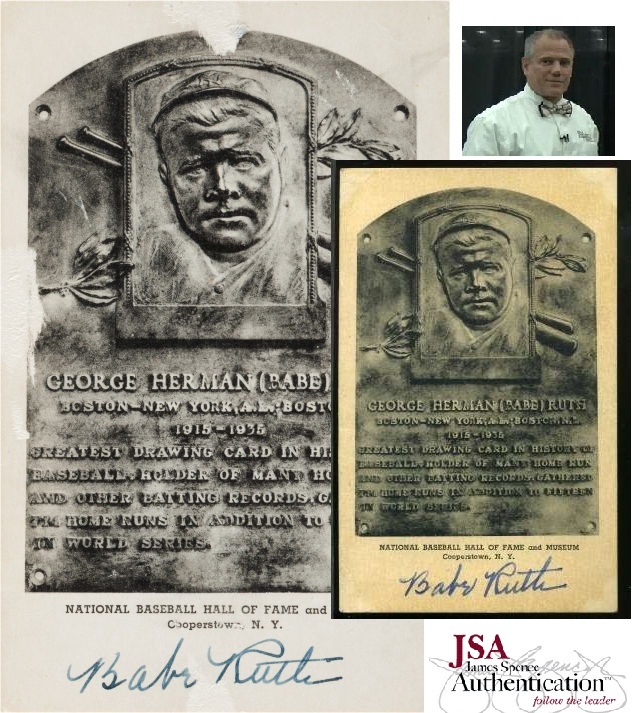 Some experts wondered if this could be the work of the late Ron Dross, but additional information revealed that Dross’ specialty was “Artvue, not Albertype HOF plaques.” Still JSA & PSA’s work authenticating Black & White HOF plaques is inadequate to say the least. These alleged autographs of the Yankee staff are signed on an authentic wire photo and most collectors might not question their authenticity. 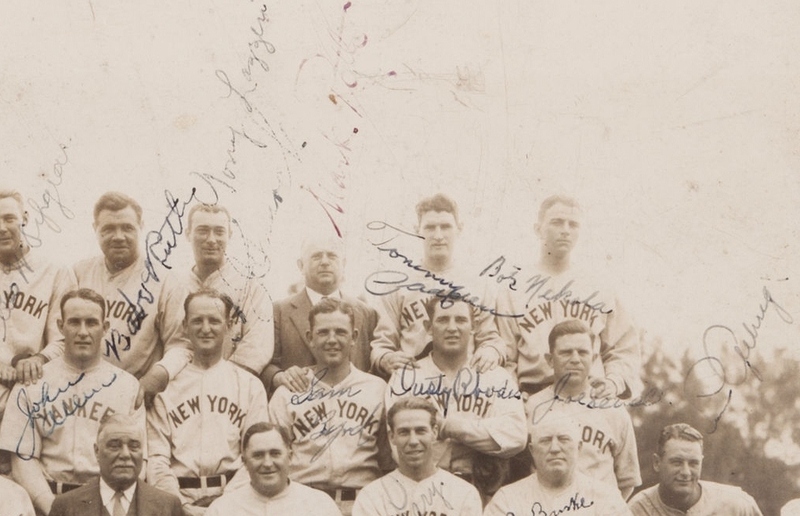 One expert we spoke with, however, called the Yankee pitcher autographs “Garbage.” He pointed to “slow and labored strokes of the pen” and was critical of letter formations and what he viewed as an assemblege he could not call genuine. In his book, Ron Keurajian points to Ruth forgeries being “signed in a methodic way” and lacking the “up and down and bouncy strokes.” This ball is a good example of what he described in his book. Chris Ivy (left) of Heritage banks on the opinions of Steve Grad of PSA (center) and Jimmy Spence of JSA (right). This assemblage would not have been possible without the pairing of TPA’s Steve Grad and Jimmy Spence with auction executive Chris Ivy, son of Heritage Auction Galleries CEO, Steve Ivy. We’re hoping this trio can learn from their mistakes and that future reports like this one will not be necessary. After we got that news, Richard Simon sent us an unusual listing of a Jackie Robinson replica ball on eBay featuring what looks like the exact same autograph as the Heritage offering (above right). When our experts viewed the Robinson single last week, the consensus was the ball was a forgery (We guess that PSA/DNA agreed?). The ball allegedly sold this evening for over $26,000 with its JSA LOA. We have a request going out to Heritage’s Chris Ivy for an explanation. How is the auction industry not under arrest they all seem to be selling stolen or fraudulent items at extreme prices. Seems major auctions should get FBI certified clean for each one think that might actually increase their auction prices. I would be scared of any cabinet card or high end autograph certified or not without FBI saying they are clean. And number climbing to number one with a bullet this week on the all time fraud chart is none other than Heritage Auctions. When will the industry ever admit that JSA and PSA/DNA are grossly incompetent through and through? Pete, I’m wondering — why would none of the experts and collectors you spoke with go on record? It is truly unbelievable,that there is so much stuff out there that isnt worth the piece it is written or scribbled on.But, I dont find it as a big surprise, seeing as who they all were hooked up with and dealt with to get all the forged items.There are plenty empty cells in the Federal joints to hold them all,so lets hope the FBI starts cleaning up the market and puts them all away. Well, me and Ty were with Earle and Ty let him use his green pen to get that ball signed. Had you goin didnt I? Shoot, i forged that ball back in 81, about the time i found those dentures at the swap meet. Wayne, A few of the people we spoke to usually have no problem being quoted on the record, but several have requested anonymity due to some sorts of retaliation by certain parties. I’m just accommodating their wishes and still enabling the readers see their opinions. In this report, there were so many who requested anonymity I decided to make it a uniform survey of unnamed experts. On a side note, I would not go to any person who I did not think was qualified to give an opinion and in our past reports you can see the names of the people who we usually consult with. Until JSA and PSA/DNA are thoroughly discredited once and for all — it may take the FBI to accomplish that — they wield enormous influence in this corrupted industry of ours. if there is no good proof that the items were signed by the person, then they should never be considered authentic.. The auction house and PSA have to stick to their original. LOA from the Mastro auction, or else they have to confront their incompetence. Looks like they authenticated a story, not a 27 yankee ball. I obtained a PSA “quick opinion” on the Jackie Robinson ball in this auction (JSA authentication) and it was described as “likely not genuine”. LOL at this rubbish. 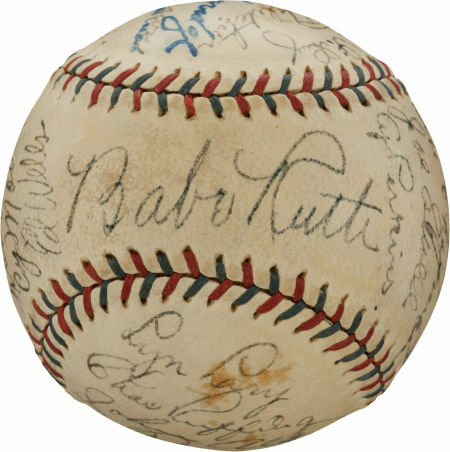 What kind of fool would believe those Yankees really all signed that ball & it looks that good almost 100 years later! We agree with them on that, as the Robinson ball was number 11 on the list we compiled. Did JSA give you any paperwork with that quick opinion? The ball was described in the catalog as authenticated by JSA. I used the PSA quick opinion option on their website ($10) and they sent me an email with their “likely not genuine” opinion. I have a unique reaction. When I was heavily addicted to collecting baseball memorabilia, I rarely paid for “scrawls.” I did have a 1918 Cincinnati ball signed by Mathewson and Roush, but that was part of my Reds collection. What is the fascination with scrawls? It seems that most of the fakes are scrawls, followed by doctored cards, and then, uniforms. I never did get the excitement derived from signed baseballs. sorry for adding my 2 cents again, but it is exactly as i told you, Heritage is dealing directly with these forgers, i truly believe they know these items are fake, i am not the brightest bulb, even i know that most of these items are clearly bogus, but to play the blame JSA and or blame PSA game, is more than a shame, IT SHOULD BE A CRIME! How much longer until heritage gets shut down like mastro auctions, still waiting to hear about legendary auctions and their bogus junk! i cannot believe people are so clueless as to deal with proven criminals,… thanks to the people who make Hauls of Shame possible, for holding these frauds accountible, and informing us what the REAL experts think! I already know jimmy spence is almost blind in one eye, but does anyone else think steve grad needs an eye exam? I agree with most,Heritage should be put out of business and all involved with them thrown in the joint.The FBI had better act real quick, cause this is getting totally out of hand and the fools who paid big $ for something that was worth 0,before really checking it out,oh well, other suckers have bitten the dust. 1 All the loops in the names look the same! 4 Many names look like nothing I have seen before, they are all tight, no flow. Hey everybody, especially you pompous “authenticators”. Get out your old letters, notes, yearbooks, checks, cards you’ve sent to people over the years, anything with your signature on it, and compare the signatures on those hundreds of pieces. Then hold a baseball,or football, or bat, or any other object and sign each of them. Do that a few thousand times over the course of a few months. Do it in a crowd, while you’re walking, standing, sitting, talking to someone. Do it with different types of pens, different inks, and then compare all your signatures. See if all these signatures look the same. Big egos, big mistakes. Signed by the “Dutch” Reuther of another universe!!!! Inked over ‘27 Yankees facsimile ball. Coombs is always immediately over Ruth on this particular rather common (25 years ago) facsimile ball!! As if the Reuther isn’t bad enough in itself, the th in Reuther is the dead giveaway as to who penned that forgery. The same th letter formation can be identified in many, very bad Ruth forgeries.